Thanks to Nick from Crispy Nuggets for re-ripping this gem for me to clean up and share with y’all! 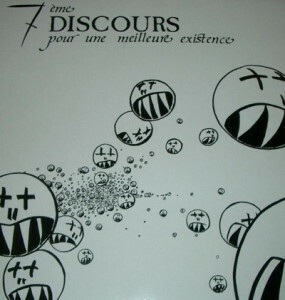 This is the lone LP from French synthpop/coldwave project 7ème Discours (Pour Une Meilleure Existence), which translates to 7th Speech (For Better Existence). A little bit of a mouthful, but what we have here is eight killer tracks of lo-fi synthpop of the highest caliber. Every track here is a gem, most ripe for the dance floor, with a few moody coldwave numbers included for good measure. Sorry for the delay, y’all. I have few things ripped to wrap up the year, so I hope to trickle out a few more posts before 2016 comes and goes. First up, here’s an excellent two-track 7” from 1981. 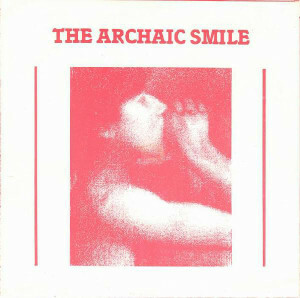 In true DIY fashion, this is The Archaic Smile’s only release, on an unheard of label featuring a two tone paper sleeve. Sadly, there’s not much I can tell you about the band itself, outside of a probable origin in Yorkshire, Englad, so we’ll have to let the music stand for itself. With that in mind, I don’t care too much for the A-side, a spastic number that seems more influenced by the likes of XTC and early Elvis Costello. It’s sufficiently springy and energetic, and thus, your mileage may vary on this. The real winner here is the B-side, a heavier, darker, and more driving affair that seems more inspired by Bauhaus and Joy Division, as if the band was aiming to wrap up the two polar post-punk extremes into one compact single. If that was the intention, it definitely succeeds! The single reminds me quite a bit of the Pop Stress single overall- especially the dynamic between sides as well as the sonic textures explored on each.